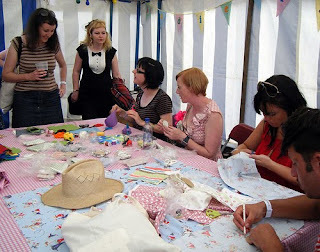 Indietracks - an indiepop festival: Fancy running an activity at Indietracks? Fancy running an activity at Indietracks? Hello everyone, can you believe it's 2010 already? We've only just packed up our Christmas trees and finished off all our remaining mince pies, and it's already time to start planning this year's Indietracks! We know you all need something to look forward to during these cold and freezing winter nights, so we thought we'd ask you to help us to organise some Indietracks-related fun now! This year's festival will take place on 23-25 July 2010, and we’ll hopefully have some exciting news about tickets very shortly! One of the most brilliant things about last year's festival was the workshops, which included a range of brilliant activities from Tatty Devine's glam jewellery-making workshop, to Sean Fortuna Pop's masterclass in How to Run a Record Label. We're really keen to run these again, so please do get in touch if you're interested in getting involved. We’ll find you a suitable area – maybe even a section of steam train – and, of course, you will have a free ticket to the festival. * Have you run a workshop before? * Will you charge for your workshop? * Have you been to Indietracks before? Any interesting stories to divulge? *You must provide all materials to run the workshop with, Indietracks have nothing! *You can charge for people to do the workshop but it must be cheap (less than £5) and the money should only be used to cover materials and not be your beer money! *You will receive two festival passes per workshop. *You will be able to sell your stuff on a stall at the festival over the weekend. We charge a standard merchant fee for a stall - details on costs and the application process are available on request. *In 2009 the workshops attracted a large number of children, and we are keen to keep the workshops child friendly. We are open to suggestions for workshops specifically aimed at children too. *The application submission deadline is 1st March 2010, and we will let the lucky applicants know within the month. NB!! Last year Tatty Devine designed a special range of Indietracks-themed jewellery, which is now heavily discounted in their New Year sale. To take a look, visit their website.